Andrews McMeel Publishing, 9781449478322, 96pp. Best friends Bitterly, Belladonna and Abyssma are back for more fun and bravery in this exciting second installment of the award-winning "Pinkaboos" book series. 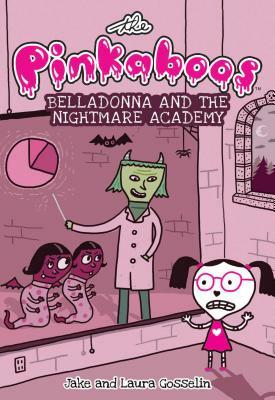 This time, Belladonna must scare away ghosts haunting a little girl's dreams, while a new fright named Wither struggles at Fright School. Things get complicated when Vex, the school bully, gets involved. Belladonna and her fellow Pinkaboos have to be braver than ever when they uncover Vex's super secret plot. Jake Gosselin grew up in Canada, where he spent his youth battling frost giants, tricking evil spirits, and talking to wolves. None of this can be proven, but it should be noted that a frost giant hasn’t been seen since 1982. As a child, Jake had numerous fears, including but not limited to zombies, vampires, ghosts, demons, gelatinous cubes, goblins, large insects, small insects, biting insects, horses, geese, monkeys, grouchy adults, and Brussels sprouts. Now that Jake is an “adult,” all of his fears are crammed into a deep corner of his mind. Occasionally he lets them out to play and writes down what he sees, which apparently makes him a writer. He lives in California with his wife, Laura; daughter, Molly; bearded dragon, Dezi; cat, Mittens; hamster, Peanut; and dog, Chewbacca. Laura Gosselin grew up in England and used to stare out her classroom window so much that her teachers called her a daydreamer. Little did they know she was thinking up fun stories she could tell one day. Or perhaps she was sleeping with her eyes open. When she was little, Laura was afraid of sharks in swimming pools and large bugs with wings. Now that she’s a grown-up, Laura is afraid of laundry, bills, and whiny children. She is also super afraid of spiders. The bigger and hairier they are, the louder she screams. After going to school in New York, living in Canada, and finally settling in Southern California, Laura has come to realize that only three things in life really matter: 1) happiness; 2) happiness; and finally, after much consideration: 3) happiness. A 1993 graduate of the Cooper Union for the Advancement of Science and Art, Billy Kelly has been designing children’s books since before you were born, if you were born after 1993. In 2004, Billy and his wife, Jacqueline, launched their very own design studio, YAY! Design, in Lewisburg, Pennsylvania, and there was much rejoicing. Since 2009, Billy has been writing and recording songs for kids. National Public Radio has praised Billy’s quirky children’s music for its “endearingly oddball sense of humor.” His songs can be heard on SiriusXM Satellite Radio and on radio stations all across the land, assuming you have the radio turned on and tuned in to the right station at the exact right time.